The National Shop Stewards Network gives full solidarity and support to this Saturday’s demonstrations in support of the NHS as it reaches its 70th anniversary. 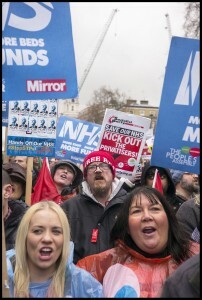 The NSSN has been to the fore in supporting health campaigns on a national scale against Tory cuts – including the demo in March 2017 and the one earlier this year – as well as in local areas such as in Huddersfield, Leicester and Mansfield where victories have been won plus many others. We have also played our part in building solidarity for health workers in struggle, including the Junior Doctors in 2016, the Serco workers in East London last year and current disputes in the North West and Yorkshire. We also send support to GMB members who have rejected the NHS pay offer and are preparing to consult members over possible industrial action. We hope that Saturday’s marches can be the platform for a massive campaign that can link NHS workers with the millions who depend on the health service and all those who are determined to fight for it. March for the NHS on its 70th anniversary: Free, for all, forever – #OurNHS70 – Saturday June 30th assemble 12pm Portland Place, London W1A. See Health Campaigns Together website and Peoples Assembly Facebook event for more details of this and other events, including in Belfast and in Wales this Sunday, where campaigners will be rallying in Tredegar, the birthplace of Aneurin Bevan the founder of the NHS as the Health Secretary in the Labour government that was elected in 1945. 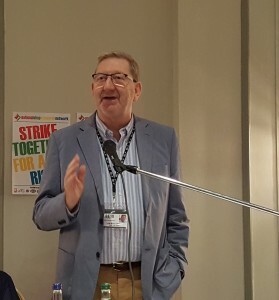 The NSSN steering committee decided to put our annual conference back a week from its original date of June 30th to July 7th to avoid a clash of dates with a this weekends events. We will be holding a workshop on defending the NHS and supporting healthworkers at our conference. Unite has been a major supporter of Saturday’s demonstrations. We are delighted that the union has agreed to affiliate to the National Shop Stewards Network and become the 10th national union to officially support the NSSN. 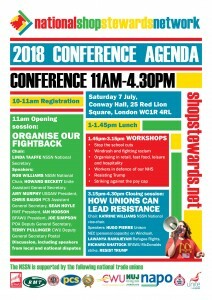 The 2018 National Shop Stewards Network Annual Conference is from 11am-4.30pm on Saturday July 7th in Conway Hall – 25 Red Lion Square, London WC1R 4RL. We also want to give advanced notice that once again we will be organising a rally at TUC Congress. This year it will be in Manchester on Sunday September 9th. We also need financial donations. Cheques made payable to Hackney Unite and sent to Onay Kasab at 33 – 37 Moreland St, London EC1V 8BB. 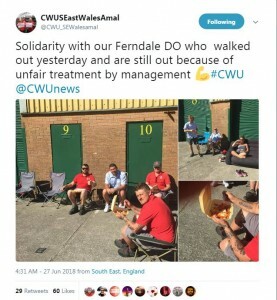 Interim agreement and cancellation of notified strike action in West Midlands (25 June) – I am pleased to be able to tell you that today I have authorised the signing of an interim agreement (which is a collective agreement) which represents significant progress in resolving some of the issues in the trade dispute. A copy of the document is attached to this circular. The agreement was reached using the NJC mechanisms for assisting local parties. I am sure you will join me in thanking your local officials for the work they have carried out that has resulted in this achievement. Accordingly, the strike action planned to take place on 30 June 2018 and 4 July 2018 is cancelled. The trade dispute is not resolved and it has been agreed with the West Midlands Fire Service that further talks will take place to try to find a resolution to the trade dispute in its entirety. Further strike action may be called in the future, but only in circumstances where, when and if it is required. Members will be kept informed of future developments. Watch the videos and if you’re angry, circulate to your contacts as well as your MP and PCC and ask them what they are doing about this national scandal? ← 394: PCS national pay strike ballot begins – VOTE YES!